The percentage of brands consumers say they could care less about has grown to 77% worldwide -- the highest level in the period of more than a decade that global ad agency holding company Havas has been tracking it. The findings, which come from the 2019 edition of Havas' every-other-year "Meaningful Brands" study, provide one of the most comprehensive views of consumer sentiment about the indispensability of brands -- as well as the components of brand "meaningfulness" -- ever conducted, sampling more than 350,000 consumers in 31 countries covering 1,800 brands. Havas has not yet released the U.S. analysis, but historically, U.S. consumers are even more discerning, with the percentage of brands being deemed indispensable falling in or near the single digits. The reason for the relatively lower levels of brand meaningfulness in the U.S. is a function of the amount of brand choice that average U.S. consumers have, Havas analysts have historically said. Following its acquisition by Vivendi, Havas rebooted the study to also look at the role that brand-related content plays in driving meaning for brands, and it published a baseline showing that on a global basis, only 40% of brand content was deemed "meaningful" by consumers. The good news is that two years later, that percentage is moving in a positive direction, rising to 42% of brand content. 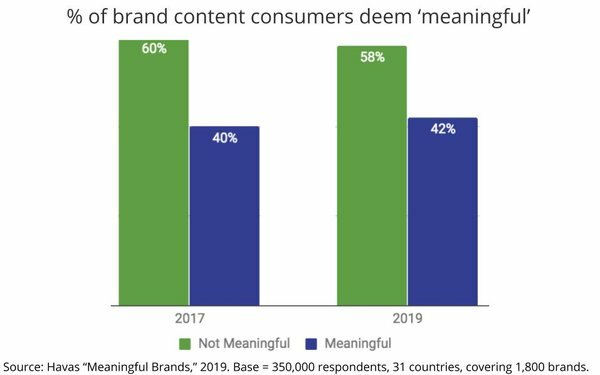 The study's release is especially timely for global and U.S. marketers, given that "brand purpose" has become the buzzword du jour in the industry. The term was the Association of National Advertisers' "word of the year" for 2018. 2 comments about "Number Of Indispensable Brands Falls To 23% Worldwide, 'Meaningful' Content Rises". Doug Garnett from Protonik, LLC, February 24, 2019 at 6:38 p.m.
Oof. A dramatic change from 74% to 77%? That really isn't anything important. And it fits - but suggests Havas should have been opposing social media far earlier. Considerable research proves this - so there's nothing new hear. In fact, Byron Sharp discusses how consumers are polygamous when it comes to brand. It's only brand marketers who don't seem to understand that. 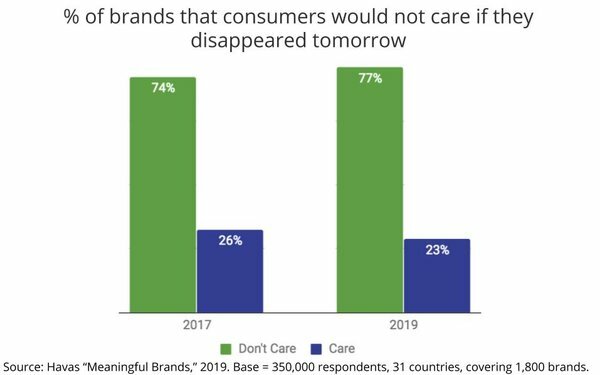 a c from omg, February 25, 2019 at 3:45 p.m.
"The percentage of brands consumers say they could care less about has grown to 77% worldwide"
Do they really phrase it this way on the survey? That would mean the literal-minded survey taker is saying they COULD care less about a brand, meaning they DO care.